So on the heels of Mother's Day, I want to encourage you to acknowledge that bad mother part of you for all she has taught you. Embrace her for the humanity she has brought into your household. And maybe even applaud her for providing some of the real and rawest moments that have and will add to the richness of the texture of the tapestry of your family. Many of us do not see in ourselves the qualities that we are in awe of in others. We think, “I could never be that brilliant, talented, courageous, or exciting.” On the other hand, there is a list of qualities that we don’t like in ourselves or others, judge as negative, and vow we will never possess or show to the world. Not wanting to be certain qualities, we whittle away at the full expression of who we are and fill ourselves up with contempt for the unwanted parts of ourselves. We don’t want to be stupid, lazy, or weak. We cannot fill ourselves up with self-love if we are hating parts of ourselves! I love the saying, “G-d [or the Universe] didn’t give us any spare parts.” Shadow work is predicated on the concept of wholeness. Every emotion and quality - “negative” and “positive” - is inside of us and they are there to serve us. Just like every experience and person who enters our life is there to deliver an insight or seed of wisdom and comes bearing some gift, so do all of our qualities and emotions. Just think about it. Wouldn’t it serve you to be selfish if you needed to create boundaries or take some time for yourself? To truly know ourselves, we must claim our wholeness. Understanding that we are smart and stupid, exciting and boring, responsible and irresponsible, and perfect and imperfect gives us access to the spectrum of qualities that we are born with and allows us to be the fullest expression of who we are. When we claim our whole self, our feelings of shame and attempts to hide who we are diminish. Instead, a deep acceptance and appreciation for all that we are emerges. When we understand we are everything, we want for nothing! Self-love flourishes when we own that we are whole and complete just as we are. Our negative self-talk is automatic. It incessantly loops around our head, creating a choir of criticism that diminishes our sense of self and turns us into our own worst enemy. Believing our negative self-talk to be the truth of who we are and what we are capable of, we play small, remain invisible, and quiet our voice. We imprison ourselves in a limited perspective of who we are and what we are capable of. Transformation is a shift in perception. The negative self-talk is not the truth of who we are. It’s just an outdated pre-recorded message that needs to be deleted and replaced with kind and empowering thoughts and words. · what we have and are, instead of what we lack and are not. Self-love will flourish when we start talking to ourselves like someone we love! Most of us look to the outer world to fill our cup. We look for love, validation, affirmation, and the answers to what is best for us from people we don’t even know or sometimes don’t even like. Instead of living on automatic pilot or looking to the outer world to tell us “what’s hot and what’s not” or what we should be doing, we need to take that U-turn back to ourselves to discern what we like, want, need, and desire. We need to start building our muscles of self-trust and self-referral. We also want to be conscious of filling our cup with things, situations, thoughts, choices, and people that are loving, healthy, and in our highest. when we make ourselves matter, so will others! Ultimately, self-love is a choice and a practice. And the good news is that if we attract that which we are, then guess what happens when we commit to a self-love practice? That is what will show up in both your internal and external worlds. Once you take on loving yourself, anything that does not have that vibration of love just feels wrong, out of integrity, or like bottom-feeding. Your tendency to settle or self-sabotage dissipates. Your being alters. Filled with self-love, love becomes the magnetizing force from which you attract. You will create and encounter more loving situations, be able to love others more fully, and let more love in. If anything other than that shows up, you will bow out gracefully and say, “No, thank you!” since staying around or settling for that would not be an act of self-love. So, as you move into today, this week, this month, take on loving yourself. If you love yourself, you will feel deserving enough to live a life that is in alignment with your highest vision of who you want to be. If you love yourself enough, you will feel worthy to truly have and be all that you can be and to claim your greatness. Find the structures that support you in doing that. And remember, who you are is love. (1) Make a list of the qualities that you don’t like or judge as negative in yourself or others. (3) Any time you start indulging in negative self-talk, tell it to “Shut the f**k up” and shift it to a thought that serves your highest. (4) Keep asking yourself “What Is the Most Loving Thing I Can Do for Myself in This Moment? What Is for My Highest Good?” and let your answers guide your actions and choices. (5) Take on learning about the shadow so you can reclaim, your wholeness. Join us at The Shadow Process Miami September 14th to September 16th or The Shadow Experience at the Omega Institute June 22nd to June 24th. Click on the links to learn more. (5) Sign up for Every Choice Matters: Choose U! a life-altering program you can do from the comfort of your own home starting Monday May 14th. In Every Choice Matters, you will be guided to discover how your shadow is in control and impacting each and every area of your life. By shedding light on what lies at the root of your choices, you will be able to make new choices -- choices that empower you, inspire you, and propel you into an extraordinary future. You will get 15% off when you register by April 30th. Learn more and register here. This coming weekend, I have the extreme honor of leading The Shadow Process Workshop in Los Angeles. No matter how many of these workshops I have attended, participated in, or led over the years, I am always in awe of the shifts that people experience in the short time span of 2 ½ days. I am also so grateful to Debbie Ford for creating a process that continues to live on and transform the lives of so many. On a personal level, I am always amazed that even after having experienced this process numerous times, I always take away so many insights and a-has! One of the most powerful concepts that emerged from one of our amazing workshops is that it is up to each of us to "claim our life!" We all have heard the adage "You teach people how to treat you." Yet what many people might not realize is that it is often your unconscious mind, which is far more powerful than your conscious mind, which tells and teaches people how to treat you and how to interact with you. It is also your unconscious mind that is filled with shadows and shadow beliefs -- all of that internal dialogue that plays in your head and repeats disempowering statements like "I am not good enough." "No one will ever love me." "It is not safe to stand out and shine or be seen." Ultimately, it is your negative internal dialogue that is your inner teacher, instructing the world how to treat you! If you don't see yourself as worthy, loveable, or someone who has something to offer the world then neither will anyone else, since how you see yourself, consciously or unconsciously, is reflected in how others see you! Debbie always used to say that if someone told her that the world treats them badly, she knew that it was because they treated themselves badly! If a person was seen as a "worker" instead of an executive, it was because the person saw themselves as a "worker" and had not claimed and truly owned that they are an executive. If you truly want to live a life that inspires you, if you want to keep evolving, if you want to step into the next greatest evolution of yourself, then you need to claim it! When you claim yourself as your highest self, the universe alters. When you claim and truly own that "I am that!" the Universe will align with your deep sense of knowing. Understanding this concept is really quite exciting because if you do your work to bring the shadows, thoughts, beliefs, and negative dialogue that live in your unconscious mind into the light of your conscious awareness, you will be able to shatter your limitations and step into creating magic and claiming the life that you long for. The really exciting news is that everything you yearn for is already inside of you. You just need to claim it! 1. Take on "Claiming Your Life!" Identify some goal or achievement that you are chasing in the outer world. Ask yourself, "What is the number one quality or characteristic that a person who could achieve that goal would display or have?" Is it confidence? Discipline? Charisma? Spontaneity? Or something else? 2. For the next 28 days, wake up every day and ask yourself, "What can I do today to really own or display that quality?" Commit to yourself to do whatever action or practice you hear. In my last newsletter, I wrote about a situation which has been causing me a lot of heartache and how, despite all of the tools and wisdom that I have as a life coach and teacher of transformation, it has been hard for me to find a sustained sense of peace. I shared how after going to healers, therapists, and doing lots of deep work around my core wounds and projections, I was so grateful to read Debbie Ford’s new book Your Holiness: Discover the Light Within because it reminded me that when I feel cut off at the knees, I need to get down on my knees and ask to be shown. Bottom line, I needed some divine guidance to support me in finding resolution, relief, and a deeper understanding of self. Days after working my way through the book and using prayer as a vehicle to connect and receive, I was running outside and heard the words, “Just be with the hurt." 3. Come to The Shadow Process April 6th to April 8th in Los Angeles. Learn more and register here. As you all know, Debbie Ford was and is my mentor, teacher, guide, and friend. I now often refer to her as my partner on the other side. Debbie was the first one who taught me that "humility is the doorway through which the Divine can enter your life." Luckily for me, and all of us, Debbie continues to be a teacher from the other side. 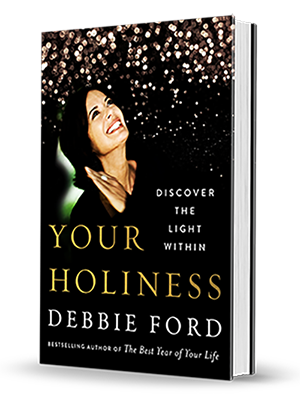 Today, Debbie's new book, YOUR HOLINESS: DISCOVER THE LIGHT WITHIN, is being released. Debbie wrote the manuscript years ago but it was not published at the time. Prayer is an ancient method of shifting our thoughts from the small self to the grander whole...Through prayer, we rid ourselves of self-doubt and self-condemnation, we cleanse our subconscious mind, and we make room for peace, happiness, and hope...Through the vehicle of prayer, we are able to navigate our way out of the darkness of our heartaches and negative feelings and find our way back into the loving embrace of our higher self. If we ask the universe to be our partner and guide us back on the path to wholeness, it will oblige. As the Bible tells us, and as I will remind you often, "Ask and you shall receive." Knowing that this book was birthed from the deepest part of Debbie's being because at the time she wrote it, she too was trying to heal heartache and bring peace to her pain, I believe that there are no coincidences. At a time when there is so much loss, grief, and struggle in the world, this book is a gift from beyond and being delivered at the perfect moment. YOUR HOLINESS is a sacred song that leads us through deeper layers of cleansing so we can attain greater levels of consciousness, connection, and divine love. Whether you have been dealing years of addiction, want to turn the tides on insecurity and self-doubt and cultivate more faith, find more inner peace, open up to your own divinity, or, like myself, are looking for an answer, insight, or guidance on a specific issue, then this book is a sweet, easy-to-read-and-use, effective guide. Just reading it brought me to holier place where I reconnected to my holiness and found a renewed sense of wholeness. I am beyond grateful that Debbie continues to teach and support all of us. YOUR HOLINESS not only helps us discover our light within but also aids us in lightening our load so we can infuse our souls with more love. (1) Order YOUR HOLINESS: DISCOVER THE LIGHT WITHIN and read it. We've put together a beautiful collection of gifts for you, so when you order the book, be sure to register your purchase and redeem your gifts here. (2) Ask and you shall receive. Is there an issue you need guidance on or are wanting more peace around? Create a structure where you ask to be shown, be guided, be given insight. Then make space to get quiet so you can receive and hear the answer. (3) Come join us for The Shadow Process. I am very excited that we are having The Shadow Process Workshop a month from now - April 6th to April 8th - in Los Angeles. Since I, like Debbie, am a firm believer in "Ask and you shall receive," then if prayer is the vehicle for asking, we also need to be conscious of tuning out the outside noise and giving ourselves the opportunity and space to receive. In a world where we are all so busy, I love the singularity that the workshop provides. For me, The Shadow Process provides a safe cocoon as well as a magical opportunity to go within, do "a year of therapy in two-and-a-half days," and heal our hurt on a deeper level. You can learn more and register here. For the past ten days I have been traveling outside of the United States. We had a packed itinerary and my intention was to disconnect and just be where I was with the person I was with. Halfway into my trip, the Parkland shooting occurred. Since these horrific acts of mass violence have unfortunately become part of our daily life, I realize that I've actually developed a pattern of how I digest these heartbreaking events. I tend to watch hour after hour of commentary, making sure I check in from the morning shows to Jimmy Kimmel Live’s opening monologue. Since Parkland is less than an hour drive from where I live and I know people who live there, I am sure that had I been home, I would have been that much more fixated on learning more. Being in Europe, I actually felt a bit guilty about not being more on top of the subject. Yet every time I entered a designer store in Paris, I was consistently struck by the lack of gun control and safety precautions in our schools. How was it that to enter a designer store my bag would be searched and in some cases an armed guard would stand at the door, but in most schools in the U.S., people can walk in carrying anything? I really was at a loss for words and also acutely aware that just words were not enough. But then standing in line at the Milan airport, I saw a video of Emma Gonzalez, a senior and survivor of the massacre at Marjory Stoneman Douglas High School, and I was riveted. A total believer in our need both as individuals and as part of the collective to break through the excuses, justifications, rationalizations, and wishful thinking and to bust ourselves of our own BS, I was in awe and applauding when she called BS on lawmakers, politicians funded by the NRA, gun advocates, companies trying to make caricatures out of today’s teens, and many of the lame one-liners people use to justify doing nothing to create change. Although we all have a tendency to do it, believing our own BS is our way to, consciously or unconsciously, excuse ourselves from taking responsibility. Instead of living in our power, we give our power away and imprison ourselves in a past that may not be fitting or beneficial for the present or the future. For change to happen, busting ourselves of our own BS is a necessary step. Another necessary step is getting to that place of intolerance. I have said it a lot lately. When we get to that point where we finally and truly declare “Enough is enough!” that is where change begins. Intolerance of that which we can’t be with anymore has always been the prelude to not only personal but also social change. I, for one, am so impressed that so many of the students of Marjory Stoneman Douglas High School have declared that they are going to be “last mass shooting in America.” You can see the fire in their eyes and the conviction in their voices and know that they will not stop until action is taken. Although people often think of the concept of intolerance as being a negative, it is often a positive. Intolerance is a tap on our shoulder trying to awaken us to action. Action is, of course, the most important step in creating change. On a personal level, I meet a lot of people who spend lots of time studying self-help and personal growth. 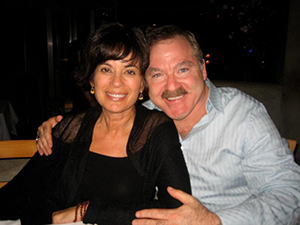 They go to seminars, and workshops and work with coachers, healers, and therapists. They have lots of insights and “Ahas.” Yet if people don’t turn their “Aha!” moments into action, change will not occur. And similarly when dealing with the collective, conversation without action is just a lot of talk. The students of Marjory Douglas High School have wasted no time in turning their words into action by planning a march and a National High School Walk-Out and publicly asking for conversations with the President and other politicians funded by the NRA. They say they are prepared to work tirelessly, so they will go down in history as the students that made the difference and made it safer for our children to go to school...and I believe that they will turn this commitment into reality. (1) Watch Emma Gonzalez’s entire speech here. (2) If you are committed to creating change in the areas of gun control and mental health care legislation, contact your congresspeople and representatives and visit websites like Everytown.org and MomsDemandAction.org. - Where are you buying into your own BS? What are the excuses, rationalizations, justifications, and BS you buy into, keeping you stuck and limited? - What have you become intolerant of? What issues, situations, patterns, relationships, or behaviors no longer serve you and are holding you back and keeping you down? - What action(s) do you need to take to create change? - Would I have heard what my child was trying to tell me or trusted authority over age, made excuses for the accused, and belittled my child's understanding of the situation? - In my zealousness to make my daughters into "strong, empowered" women and/or "to support their dreams," would I have minimized anything that sounded like "whining," "complaining," or "excuses" and encouraged them to barrel through any obstacles or keep their eye on the prize? - Would I have downplayed, avoided, or not truly listened to what my daughter was telling me because I was more committed to working on a project, trying to nurture a relationship, wanting more time "to do me," or maintaining the status quo? Bottom line, no matter what the reason, would I have denied, diminished, discredited, doubted, or dismissed what my child was telling me because it was… an inconvenient truth? Although little compares with the horrific circumstances that happened in the Nassar situation, many of us grapple with inconvenient truths in our personal lives all of the time. Whether it is the business partner who wants to deny a colleague's questionable behavior because their net profits are increasing, the spouse that ignores their husband or wife deleting texts and hiding the code on their phone, the person that excuses unhealthy habits because the number on the scale is going down, or the baby boomer that doesn't want to compromise their freedom to take care of an aging parent, many of us turn a blind eye, especially to those inconvenient truths that we don't want to deal with. Denial is a powerful ally and negotiating tool when it comes to combating inconvenient truths. "Denial seems like a clever place to hide. It keeps us anchored in a seemingly safe harbor where everything is familiar. It may be a mess, but at least it feels familiar! When sheltered by denial, we often interpret threats and problems as benign or pretend that they don't exist. Like all blind spots, we can't see through our denial. It's insidious. But if we are going to live lives of integrity, we must confront our denial. We must recognize that denial keeps us blind to what is and limits our ability to find positive solutions and inspiring possibilities." There is usually at least one area of our lives that we are willfully looking the other way, covering something up, suppressing that gnawing feeling inside, or denying an inconvenient truth. And as we are all seeing in stereo in the today's world, it only takes one situation in your life to ruin your entire life. That is why no matter how uncomfortable or inconvenient it may be, we all need to take time to listen, to pierce through the trance of denial, and to trust that if something is coming up, whether individually or collectively, it is coming up to be re-examined and dealt with. In the end, denying inconvenient truths may be convenient in the short term but, more often than not, that behavior will never lead to long-term fulfillment. Instead it will chip away at our psyche, wanting and needing some attention, until it festers and causes an explosion in our lives. Ultimately, as I grapple with this concept of inconvenient truths and where and how I have denied them, I feel incredibly grateful that I did not have to deal with the circumstances that the parents of the "army of survivors" did. Although I, like everyone, wishes this or any horrific, sick situation never happened, we know that they did and do. I am extraordinarily grateful to all these courageous women who spoke so bravely, authentically, and eloquently. Their words act as a reminder to all of us that there are the perpetrators and enablers, and we all need to look at how and where we are and have been that and what we can do differently. I, for one, am looking at the stories I tell myself that drive me to want to turn a blind eye or deny a situation since it may be inconvenient to deal with at the time. I know that if I can unconceal and bust through those stories and understand that they are just that – stories I tell myself - then I have the power let go of that story and choose another interpretation for the situation that, instead of repelling me, will compel me to take positive action. Then I can go from imprisoned to empowered, meet whatever situation head on, and be the change I want to see in the world. (1) Dwell in this conversation about inconvenient truths this week. As you take on this exploration, don't use what you find to beat yourself up. Look through the eyes of fascination and the perspective of promise. (2) Look around your life. What are the situations or subjects that you have or that you are denying, diminishing, discrediting, doubting, or dismissing? (3) As you find these situations or subjects, let yourself see the stories, beliefs, and fears that cause you to turn a blind eye, deny, and not deal. (4) Spend some time journaling about what you get from your denial as well as what the costs of denial. (5) Allow yourself to see what would be possible if you dealt with the situation head on. (6) Create an action plan for dealing with your inconvenient truths. (7) To step into your truth, ground yourself in the fundamentals of an integrity-guided life, and join a supportive online community, sign up for the very special and affordable program I created just for you - The Integrity Advantage Initiation Program. This 4-week online program starts Monday February 12th. (5) To truly accelerate your mindfulness practice, join us at The Shadow Process April 6th to April 8th in Los Angeles. Click here to learn more. This is a tremendously powerful time of year -- a time when the universe is moving all of us in an exciting and positive direction, a time when everyone, whether they know it or not, is looking to complete the past and move into a new future. 2018 offers all of us a new beginning! We're excited to share with you Debbie Ford's 2008 New Year's Ritual (with a few updates) to support you in opening up to a new future. This ritual is a great opportunity to powerfully end this year, igniting new possibilities in your inner and outer worlds, so we invite you to set aside some time to read her message and do the exercise she outlines. We at The Ford Institute are wishing you a healthy, happy, inspired new year. 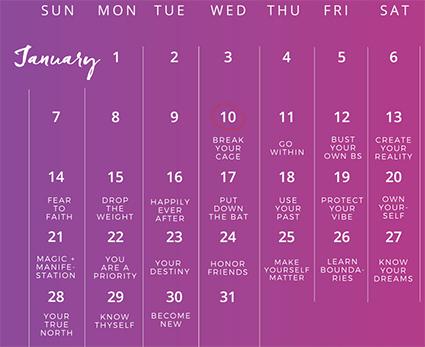 We hope you'll join us for The 21-Day Integrity Challenge to kick off the new year. (You can read more about that below the ritual.) We look forward to continuing to support you in 2018. This morning in my meditation, I thought about all the people I love, of course all of you -- and this was the message that came to me to deliver to you. I hope it nourishes you as much as it did me. Every New Year’s Eve, we make resolutions that this year will finally be different. We vow that this is the year we will land that new job, get in great shape, find the man of our dreams, or quit smoking. We spend our days thinking, talking, and dreaming about what our lives could be like 'if only ...'. We follow a new diet, we start exercise routines – we begin working on our lifelong goals and then we give up, get too busy, and forget about what's truly important to us. Another year passes by and our dreams remain out of reach. From leading thousands of people through the transformational process, I can assure you of this. Although people think they're chasing a goal that may or may not happen, the truth is they are chasing the feelingthey think they'll have when their dreams come true. Really breathe that in. What you are craving is not the outside goodie — the new career, the fit body, the loving family — but the feeling that you think you'll experience when you get it. The great news is that you don't have to wait to feel that feeling. You can feel that way right now. Every feeling that exists - all these levels of consciousness, frequencies, and vibrations - exist inside of us right now. Our job is just to activate them. When you feel the feelings you most desire, you're more likely to achieve the goals and dreams you have for your life. Here is a ritual to support you in discovering that the life you've always wanted is right in front of you, well within your grasp. Take some time to journal and answer these questions. What is one feeling you most want to explore or align with this coming year? What feeling would be worth giving up old patterns, behaviors, opinions, beliefs, thoughts, and judgments? To help pick your feeling, I recommend you find a "feelings list" online to prompt yourself. Or you can think of a goal you've wanted to achieve and then ask yourself "How would I feel if I achieved that goal?" Even if it seems challenging, for the purposes of this ritual, make sure to pick just ONE feeling you MOST want to feel in 2018. Write it down. Reflect on how this feeling would push you to take risks and step into your next highest expression. How would you act differently if you were living a life grounded in that feeling? What would be different in your world? Write it out in great detail. Let yourself see how your alignment with this feeling could serve the greater whole. How would it help those around you? What would you be able to do if you felt this feeling? Make some notes. Call forth three images that evoke this feeling, images you can revisit to ensure that you're living on that frequency this year. For example, if you want peace, you might see an image of a still lake, a person in meditation, or people holding hands. Allow yourself to see three images that will anchor you in the feeling you most desire. Select a color that most reminds you of this feeling. What color would best evoke the feeling you've chosen? Find a phrase -- an expression, a line in a prayer, a part of a poem, or something you write yourself. For peace, for example, it could be "Be still and know that I am G-d."
Pick two synonyms for the feeling. For peace, for example, you might pick "serenity" and "contentment." Choose a song that matches the feeling you want. Go through your music library or put your word into the iTunes store. Find yourself a theme song for the year. See two behaviors that you can do every week this year that would bring forth the feeling inside of you. For peace, it might be going for a walk in a park near your home, going to pray in a spot that you like, or reading part of a book. Find a beautiful piece of paper or notebook. In your best handwriting (or most beautiful font on your computer), write out all these details -- the images, the smell, the color, the phrase, the synonyms, the song, and the behaviors. Make copies of your list and put them around the house so you will be reminded. Finally, at least for the next 21 days straight and ideally each and every day of the new year, spend a minimum of two minutes at the beginning of the day and before you go to bed holding that piece of paper, reviewing your list, listening to the song, smelling the smell, repeating the phrase. Bring yourself into the presence of the frequency. Feel the vibration. Bask in that feeling. Close your eyes and ask the powers that be to support you in bringing forth the highest expression of the state of being you have chosen. I promise that when you live your life this way, you won't have to worry about your resolutions or your goals. You'll get everything that your heart desires. As you start a new year, know that I am wishing you a fantastic year. May all your dreams come true. Have You Joined The 21-Day Integrity Challenge Yet? One simple action can change everything. In The 21-Day Integrity Challenge starting on Wednesday January 10th, you will enter into a conversation where each day you will be invited to a look at an aspect of your life to determine if there is anything that needs to be re-examined, released, replaced, resolved, or reignited. Each day you'll receive an email in your inbox with your challenge for the day. You will be invited to engage in different inquiries, actions, and practices to cultivate integrity. You'll also have access to a private Facebook group where you can share your progress and support your fellow members with ideas and inspiration. Don't miss this day-by-day, step-by-step guide that will aid you in shedding and cleaning up the ways you have been out of integrity so you will feel empowered, worthy, and ready to own that you are whole and complete and to live in alignment with your deepest truths and grandest desires. The "Silence Breakers" represent what The Integrity Movement is all about! Join the movement! What Do You Need To Eliminate Before 2018? As the holidays kick into high gear, I am thankful and a bit overwhelmed as I fill in my calendar. There are parties to attend, dinners to organize, presents to buy, decorations to hang, and visits from out-of-towners, friends, and family to prepare for. As I anticipate the month to come, it feels like my to-do list is infused with a sense of accumulation. Although I look forward to the abundance and merriment of delighting in the decadence of December, I also feel a strong sense of urgency to resolve and handle certain issues so I do not carry them forward into 2018. And the good news is there is still time. "Integrity is a process of elimination—you need to let go of that which you have suppressed, clean out that which does not serve you, let go of toxicity, and make space. To flow freely and powerfully toward the future, you must eliminate anything that might have a gravitational pull to the past or keep you connected to old karma or chaos. It’s like pulling out the old weeds before you plant new seeds, washing your face before you put on makeup, or clearing the table before you set it for the next meal. You always want to start with a clean work space." What incompletions do I need to address? What do I need to clean up? What or whom do I need to let go of? Already this past week I threw away garbage bags full of old papers, gave away clothes that I have not worn in years, dealt with an issue that required me to actually go down and wait in line at the Social Security Office, and finally got someone on the phone at Apple to discuss the recurring charges that appear on my credit card statement each month which I have no idea what they are for but since they are only add up to a few dollars, I justify ignoring. Although on the surface each of these issues were “small,” the feeling of space and freedom that I feel now that they are resolved is huge. It fuels my desire to rid my life and surroundings of anything that might consciously or unconsciously be a drain on my energy. So as the year draws to an end, I want to encourage you to be mindful to not let your focus on your holiday shopping list deter you from spending time doing end-of year clean up. If you want to ring in 2018 with a sense of clarity and calm and joyously jump into January, than I invite you to join me in taking on elimination as well as accumulation. Spend time looking at your life through the eyes of elimination. What incompletions do you need to tackle? What situations or relationships do you need to clean up? What or whom do you need to let go of? (2) Make a list of action steps and make sure to schedule these action steps into your calendar. As each one of my three daughters comes home for the Thanksgiving vacation holiday, my heart expands and I am overcome by all of the amazing gifts that I have in my life. As I wrote on the dedication page of my new book The Integrity Advantage, I am blessed to have amazing women in my life to learn from, laugh with, and lean on. In particular, I publicly acknowledged my mother, my three daughters, and of course Debbie Ford. A woman of courage, brilliance, and faith, Debbie radically shifted so many people's lives - especially mine. Through her teachings, wisdom, honesty, and vision, Debbie gave and keeps giving me - and all of us - the gift of liberation. - How do I once again try to explain to my family why I have to bring my own food since I eat - vegan or gluten-free? - What can I do to appease my parents and in-laws, who are all divorced but expect us to show up and make their Thanksgiving meal the most significant one? - How should I handle it this year when, at the last minute, my sister-in-law once again decides to invite four more people to dinner? - What do I do when Uncle Bob brings up politics and the holiday goes from being about pilgrims, Native Americans, and gratitude to Democrats vs. Republicans and hate and hurling insults? - How do I not get pissed off at my family when they stay glued to the couch and watching TV as I do all of the work in the kitchen? Your first instinct might be to cancel Thanksgiving or hide because you just want to avoid the inevitable or you are afraid you will do what you have done in the past, remaining silent or passively standing by and pretending things are "fine" as you face dive into the mashed potatoes, drown your sorrows in a bottle of wine, and unconsciously choose self-sabotage over self-love. But checking or numbing out is not the best option. Neither is doing what you have done in the past -- avoidance, settling for crumbs, enduring the explosions or inappropriate actions and behaviors of others, or allowing yourself to self-implode and then berating and beating yourself up for it later. It is time to turn the tables on turkey day trauma and trepidation. It is time to declare a no-tolerance policy when it comes to putting ourselves in unhealthy scenarios in which we do unto others better than we do unto ourselves as we compromise our wants, needs, desires, and truth. It is time to initiate some new holiday traditions! - Tell your sister-in law that the cut-off day for any additional guest is the Monday before Thanksgiving. - Give each family member a list of tasks you need them to perform and add in a time frame for when they need to be done by. - Call your hostess and ask what they will be serving to see if it meets your dietary needs and then check if you can bring some "sugar-free" or gluten-free options. - Remind your in-laws that you will be eating dinner at your mother's house and will be at their house in the afternoon to say hello. - Declare the Thanksgiving table a "no-politics" zone. It is better to know myself, not to test myself! If I know that leftovers will wreak havoc with my food plan, then instead of hoping that this year I will be able to resist the leftover chestnut stuffing or deep-dish apple pie, I eliminate the temptation and allow myself one "leftover day" before I give the excess food away. If year after year, I get angry with my children because they are late getting dressed and out the door for Thanksgiving dinner, then to defuse the situation before it happens, I let them know in advance what time we are leaving and invite anyone who is not sure what they are wearing to model it the day before so there is no last-minute drama. If I always feel overwhelmed by my holiday to-do list, then starting two weeks before, I start peppering into my schedule the things I can do ahead of time so I don't feel rushed and exhausted the last few days. Although I might like to think that this year I will handle things differently, chances are I might not. That is why I love this concept of knowing myself instead of testing or tempting myself. It supports me in embracing my humanity and creating structures that are accepting of what is and planning accordingly. Changing your holiday karma is possible. But we need to be as mindful about creating our holiday Integrity Protection Program as we are our Thanksgiving menu. My hope is that, to whatever extent you need to, you can turn the tables on turkey day trauma and trepidation and have the yummiest of holidays. Start formulating your holiday Integrity Protection Program. What boundaries do you need to establish with others? What structures do you need to create that will support you in successfully navigating your family's issues and dealing with their dynamics? If you take on the concept of knowing yourself and not testing yourself, what structures can you put in place to safeguard yourself from your own weaknesses and pitfalls? Make a conscious choice to have a wonderful Thanksgiving and walk through the holiday with eyes of love and gratitude. Get The Integrity Advantage to learn even more about setting up your own Integrity Protection Program and the benefits of living an integrity-guided life. Join The Integrity Movement and stay tuned for news about our first-ever INTEGRI-THON when we will be cleaning up and clearing out anything that no longer serves us and takes up space so we can make room for that which does. As many of you know, this past week, my first book, The Integrity Advantage, was released. It was a pinnacle moment filled with a smorgasbord of emotions. It quickly turned into a somewhat surreal experience watching this baby being birthed out into the world, seeing people holding the book in their hands, and knowing that they would soon be reading my words.